If the tiers climbed slowly with the ranks, and the rewards scaled up as well, then I would jump all over it. Save T10 for the last 5-7 ranks. Plenty of other things to do here, and I wish those who stick with it all the best of luck. May your rounds never fall short. Lol yeah it was insane getting up through the Ranks to reach Rank 5 and teams are now often more reasonable to deal with, but of course also more skilled on both sides lol. But either way it’s more optional for me since I have the Corgi Fleet Jolly Roger Flag from being a Corgi Captain which is my favorite and most precious Flag I own. 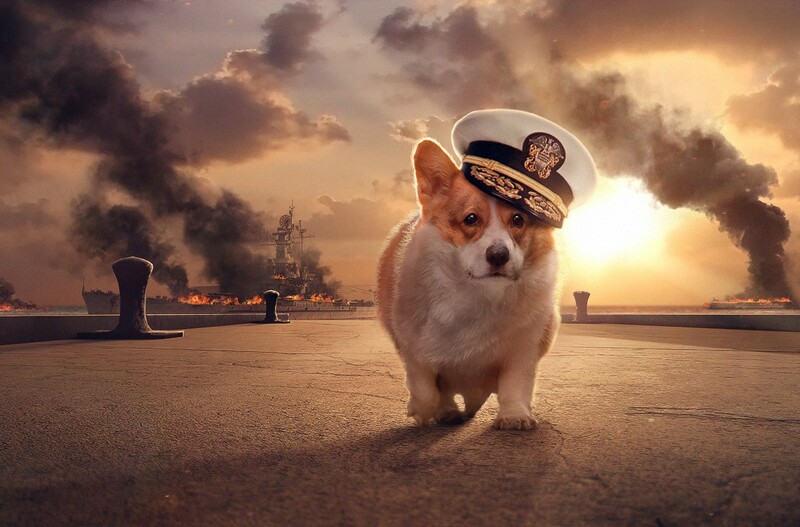 That was such a good weekend sailing with SuperNikoPower, but also bittersweet since it was the last time the Corgi Fleet would sail officially since Niko had to step down due to Wargaming shutting down the California HQ they had. But we certainly made the last weekend of the Corgi Fleet a very memorable one, and many of us still probably fly the Corgi Fleet flag, so the fleet does live on with us. I am sure the current set-up is due to customer feedback and community preference in the majority. I wouldn't be so sure. I'm not saying I know anything about it for a fact, but there were an awful lot of "Again? Really?" posts. After the first week, the teams in R5 are just as bad as R6-R10. And it continues to get worse as the better players rank out and more potatoes fail their way into R5. This season seems to be different, a real pain to rise above Rank 12-9 Range, Rank 6 also tries to hold you there. Rank 5-2 has been a lot of players with clan tags that I recognize as skilled clans so still a lot of good players that have not Ranked out yet. You may have seen some of the threads talking about how bad this season of Ranked has been skill wise, well that has really had an effect on progress. I got nice early start and still ran into trouble, and some good players I know are still stuck in Rank 11-10 Range because they are at the mercy of the teams and MM. Think part of the problem is tier X Ranked is not as popular as some of the other tiers, so that thins out the Ranked pool and helps create the current situation. The Rank 5-2 pool is certainly small enough that I doubt many bad players have risen this far up. WG really needs to fix this crap. For the players that make it to tier 5 there should be a irrevocable stop point there. some of us do our best to get to there only to get dragged back up the ranks because of players that are dragging them back because they don't play right. we had players the other day that were just going in and giving the win to the other team. And not saying they ran in and got hit with radar. I am talking. drive right over to the other side and say hi i am here. Why can't there be a safe zone for the players that are truly trying to get to rank one. We are the one's that get punished for not winning. I was at rank 4 with 3 stars and then got nothing but terrible teams. And when i looked at their ranks. It was players with rank 6 7 8 and i was the only 4. yes because my team looses. I get set back to rank 7 now. This is total [edited]. Put a stopper in the rank levels war gaming so we aren't being punished for other players mistakes and just not caring. If you guys want to win every game based on good intentions how about you go ahead and play coop. Forever. If people are still stuck in the 10-11 range at this stage, they aren't good players. It's really that simple. And the people I have noticed complaining the most on the forums about bad teams in ranked tend to be the below average players who need to be carried to victory and cannot move up on their skill alone. In other words, people who blame MM for their inability to advance are often the problem. No, R5 does not need to be an irrevocable rank. That's a really bad idea. R10 being irrevocable last season was bad enough, no need to add another pit stop for potatoes and griefers. Looking at your stats and ranked stats, it's not the other players that are dragging you down. Some people have to either accept they are not good enough to rank out and that if they want to, its going to take a boatload of games to do so. Ranked isn't that hard if you are a consistent player. I've ranked out the past for seasons, in 161, 159, 282, and 162 games. You can see that even with consistent people, it is possible to have a really rough season, but anything over 300 games is probably proof you're not meant to rank out. Unless you want to keep spamming games. Yeah the few good players I know that are still stuck in Ranks 11-9 at the moment have either started late or had to go on buisiness trips for few days or something and got delayed, and couple of them have just been having really bad luck. Like I love my Yamato and can do well in it, but not of the team in clueless and literally scatters in all directions and I have to deal with 2-6 DDs alone. So I used DD to get through as well as my Zao until I got to higher ranks that more often would play little more as a team and the DD count lowered and have been able to use Yamato again. But if you only had 1 class of ship and tried to work through some of those Ranks then the MM can unleash horrifically bad luck on you. Unless as I said you have several options in ships to choose from and are a good player then you can break through. I feel bad for my friends still down there since when I got through things were getting bad, so can only imagine what they are having to deal with every battle and nothing I can do for them other then give them some positive encouragement. Lol but let me tell you I am lighting a fire under my ships to get to Rank 1 before Ranks 5-2 get flooded with bad players lol. Although there has seemed to be a sort of “MM wall” that makes Ranks 7-6 rather difficult and makes you prove if you are worthy to get into the better Ranks, so at least for the moment that will be shielding the highest Ranks from a lot of the bad, but doubt that will hold up for too much longer. Well, yeah, if you only have, say the Shima, you're going to have a bad time. No doubt. The issue I have is all these ranked complaint threads tend to come from average to below average players who cannot win or save their star consistently enough to move up and instead want to blame everyone else on their team for being bad, when the reality is they are just as bad as the potatoes they are complaining about. It's not like every match is "unicums vs. potatoes" and they just so happen to always be on the potato team. They need to be carried up the ranks and get salty when that doesn't happen. Sure, there are going to be games where you end up on trash teams, but that happens to everyone. The good players save their star that game and move on to the next one. I do want to note that I don't think you're one of the people I'm talking about. You seem to be taking the struggle in stride and not solely blaming MM. +1, I feel the same way. Always have my Corgi flag sailing.